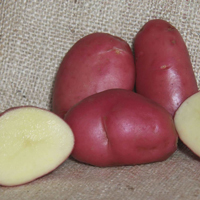 Large oval tubers which bulk up early combined with high yields make this a small growers favourite. Reasonable resistance to viruses and blight too. In the kitchen cooks love them  pink skinned with firm yellow flesh they are one of the most versatile potatoes in the pantry. Sarpo Mira is one of the varieties developed by the Sárvári family Hungary who have been breeding potatoes for high natural resistance to late blight for over 40 years (without using GM technology). Maincrop - Red skin and cream flesh.